asra's: Knowledge - A Transition? How rightly has someone said this. Those of us who read (and to some extent those of us who do not) know this, for a fact. The obvious reason being its experience in our lives since the day we started to read up to today. When one thinks of knowledge, the mental image of scores of books neatly stacked or randomly scattered builds up in the mind’s eye. This image provides ample amount of pleasure to the person, provided one is truly intending to gain knowledge. This might come out as an exaggeration, but believe me, while I am writing about this, I can view stacks of books, old and new, arranged neatly in rows. Imagining the smell of it all makes me so delighted, that I wish to stop writing and run off to a library! However, in the recent past this has come to change. 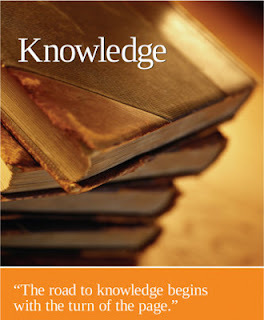 Recently, I read an article in The Times of India – Education Times, dated 25th April 2011, titled ‘Knowledge is Power’. Without going much into the details of the article, what captured my interest was the picture associated with the article. It struck me that though knowledge in itself is always the same; the mode of obtaining it has (perhaps) changed. For years, we thought (or had the impression) that the internet is a source of information and not a source of knowledge. This has unmistakably changed. In support of this, we see examples such as students referring the internet during their project works at schools or colleges. The material that is unavailable to them in their texts, they find it on the internet. I myself turn to the internet for (yes) knowledge now! But why fume over this one might ask? No reason at all of course, I say. Try as one might to shut them self from this change, it will shine out of the darkness they have created by closing their eyes to it. ‘Change is the only phenomenon permanent in this world’. Accept it to understand it.